Dear Life, after our (almost) 30 years together, your wry sense of humor still continues to impress me. 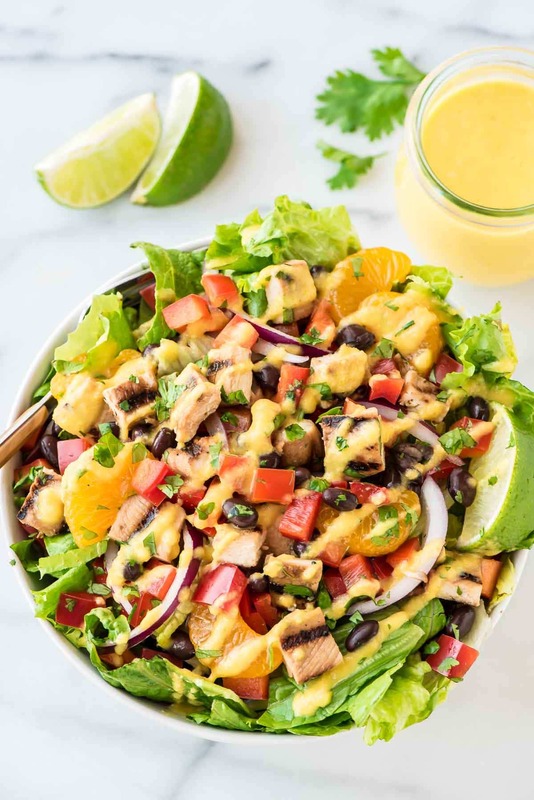 As I write this post, an island-appropriate recipe for Caribbean Chicken Salad with Mango Dressing, I can see April snow falling outside of my office window. Bring me a rum punch and my fuzzy slippers, please. Actually, make that a double rum punch, earmuffs, and extra mango dressing on the Caribbean Chicken Salad, pretty please. Although it seems illogical to be telling you about this Caribbean Chicken Salad when my front yard is covered in snow, the inspiration for the recipe actually came from Wisconsin. A few weeks ago when my friend Laura came to visit, we went to check out the Milwaukee Public Market, a large, airy building that permanently houses row upon row of food vendors and market stalls. Whether you are looking to take home lobster tails, wrap your hands around a gyro, indulge in a slice of cheesecake, or sip a margarita, the Public Market has something to satisfy your craving. After a hefty serving of blueberry coconut French toast earlier that morning, I was in the mood for something lighter, so I stopped at a custom salad stand and ordered the feature of the day, Caribbean Chicken Salad. It was perfect. A mixture of crisp romaine lettuce, juicy grilled chicken, black beans, sweet oranges, and red peppers, the Caribbean Chicken Salad I tried at the market was packed with goodies, flavorful, and filling. It was topped with a lightly spiced, citrusy mango dressing that gave the salad a tropical twist. The overall combination was so tasty and unique, I found myself craving another round of it a few days later. This recipe is my at-home recreation of the Caribbean Chicken Salad, and it hits the spot on any day, even a snowy one. For max flavor and easy grilling, I recommend using thinly sliced chicken breast, because it quickly absorbs the Caribbean marinade—a 30-minute “bath” was all my chicken needed to soak up some serious flavor. Thinner chicken also means faster, more even grilling. 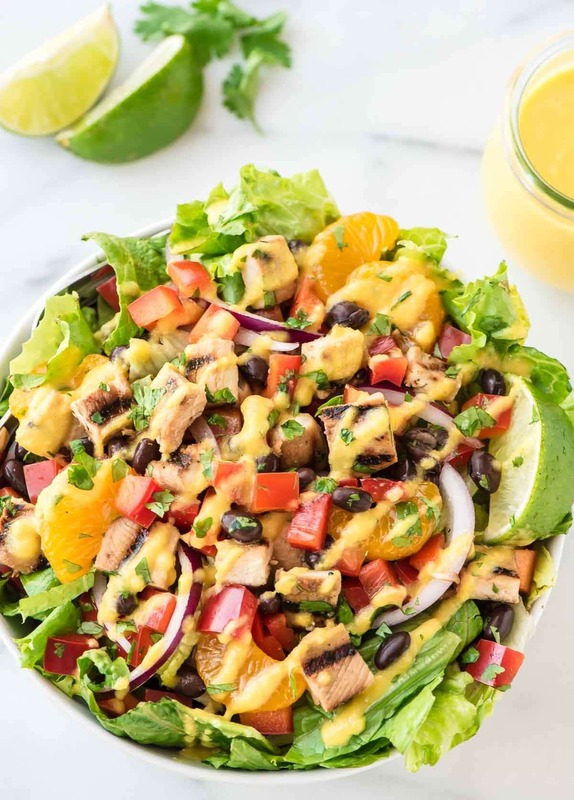 Once I had the ingredients prepped, this Caribbean Chicken Salad came together in fewer than 10 minutes! For the mango dressing, you can use fresh or frozen mango. I’m fairly addicted and have made the dressing both ways. Both are delicious, but I’m giving the edge to the frozen mango. Not only did I not have to wait for the mango to ripen (a painful process when one is craving Caribbean Chicken Salad rightthissecond), but also, I didn’t need to fuss with slicing it, a process that, no matter how easy it looks on YouTube, I cannot seem to master. 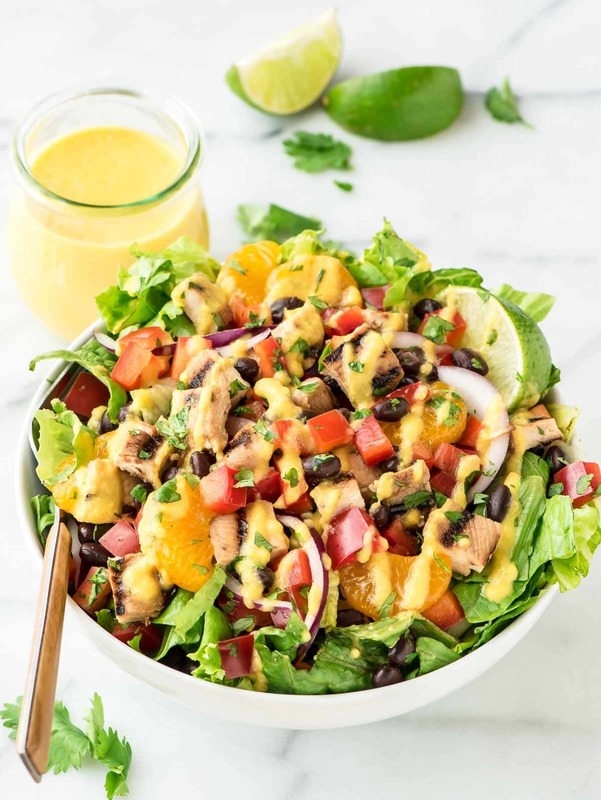 A recipe for grilled Caribbean Chicken Salad packed with crisp veggies, black beans, juicy chicken and sweet oranges, topped with a tangy mango dressing. Place the soy sauce, olive oil, brown sugar, and ginger in a gallon-sized ziptop bag, seal tightly pressing out all of the air, and "squish" to combine. Add the chicken, firmly seal the bag again, and move the chicken around gently so that all sides are coated and it lays flat when the bag is on its side. Let marinade for 30 minutes or refrigerate overnight. (If refrigerating overnight, let the chicken stand at room temperature for 30 minutes prior to grilling.) Meanwhile, prepare the dressing and other ingredients. Place the sliced red onions in a small bowl with water. 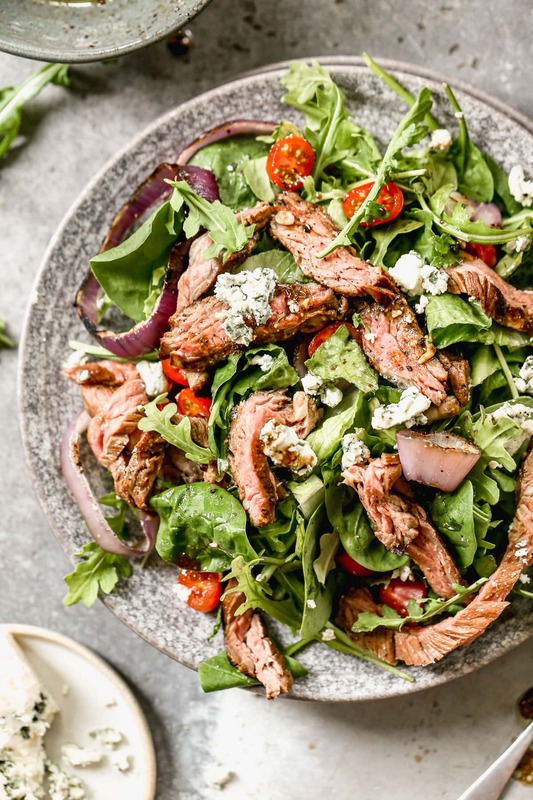 Let sit while you prepare the rest of the salad (this mellows the red onions' bite, while maintaining their flavor; if you like the taste of raw red onion as is, you can feel free to skip this step). Make the dressing: Puree the mango, lime juice, honey, cumin, coriander, and cayenne in your food processor until smooth. With the processor running, drizzle in the olive oil and blend to combine. Taste and adjust seasoning as desired. Use for salad, then store leftovers in an airtight container in the refrigerator for up to 1 week. Shake well before using. Cook the chicken: Heat a grill pan or an outdoor grill over medium heat. Remove the chicken from the marinade, lightly shake off the excess, and grill for about 2 minutes per side, until cooked through (see ingredient notes for more information about length of cooking time). Remove to plate and let stand for 5 minutes. Cut into bite-sized pieces and set aside. 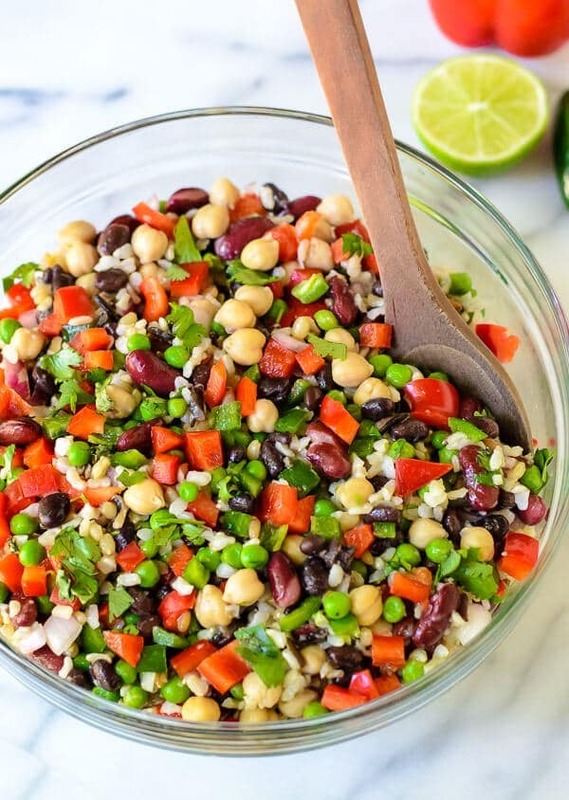 In a large bowl, combine the romaine, red bell pepper, black beans, and red onion. Add the chicken, drizzle with the mango lime dressing. Toss to coat. Scatter the oranges and cilantro over the top, then serve. *If you cannot find thin-cut chicken breasts, you can use two regular chicken breasts by splitting them in half horizontally. Each of my thin-cut breasts weighed about 2.5 ounces and was less than a quarter inch thick. If your chicken breasts are thicker, you will need to grill them for longer. Store leftover mango dressing in the refrigerator for up to 1 week. Gorgeous photos Erin!! I’ve been eating these kinds of salads lately in attempts to bring good karma for spring weather and I think it’s FINALLY HAPPENING! :) Haha thank you for sharing! Puréed mango in dressing is basically one of the most genius things I could ever imagine- love this! This salad has so many things going on & I am in love with every single aspect of it!! Love how you made this into a filling salad perfect for healthy dinners!! 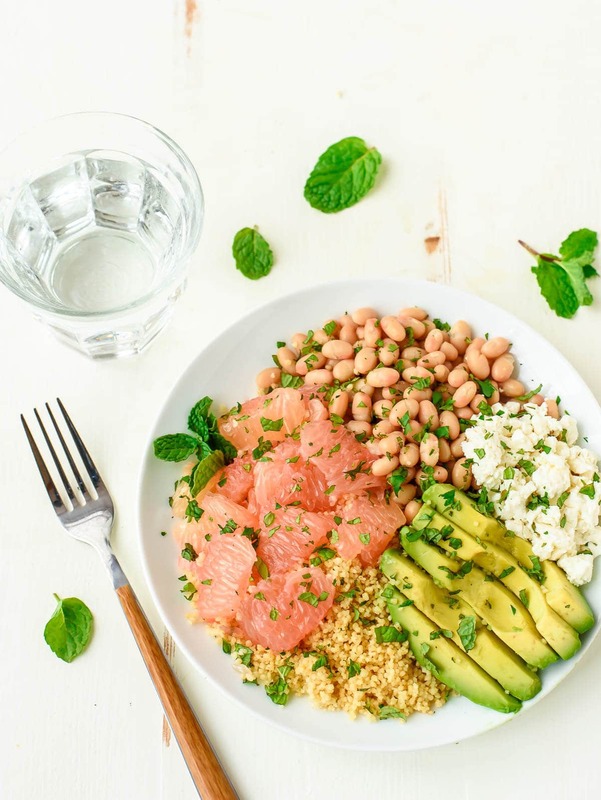 This salad makes me want to be on vacation, and eating it will definitely be the next best thing! That mango dressing is pure brilliance, and I bought mangoes at Costco today, so you can BET it will be happening ASAP. Yum! This looks colorful and crunchy and full of flavor and totally drool-worthy. Im obsessed! Today would be a perfect day for this extra yummy looking salad!! 74 degrees and full of sunshine but this weekend we are suppose to turn cold and possibly get dumped with snow, whaaaa!! Sounds like you should make the salad and hibernate, LOL. Thanks Malinda! 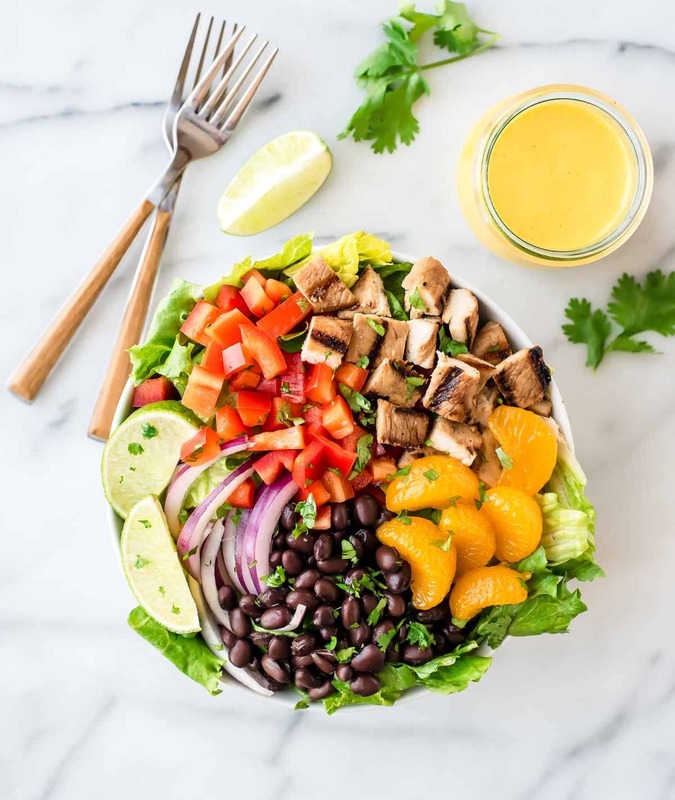 This caribbean chicken salad is combination of taste, I like a balanced diet, a variety of protein and vitamin supplements so that they will have good health. I found your post from Pinterest! I’m also gonna pin this post on my Pinterest board my followers will love it.